Tonight on Top Chef Duels, masters of Southern cuisine Art Smith and Kevin Gillespie take on a good old-fashioned critter fry. As we thought about the critters we eat, they generally fell into two categories: scary ones to run from and cute ones that could qualify as pets, under less dire circumstances. But which of the two is better to eat? In this week’s duel, Justine Sterling defends eating the terrifying while Noah Kaufman endorses consuming the adorable. JS: While chocolate-covered tarantulas have their moments at county fairs, they won’t be replacing Goobers at the movie theater. But there are definitely communities where eating grasshoppers or rattlesnakes is a thing. NK: First we better address the qualifications of cute critters, because under the right circumstances almost any animal can be cute. You put a tiny sweater on a chicken and we guarantee it could be categorized under 10 Animals We Wish Were Actually Our Children. We’re talking about small, furry creatures that could be classroom pets or animated for children’s movies. And despite that cuteness, people love to eat them. Squirrels fed you while playing Oregon Trail and continue to be served throughout the Southern United States. And rabbits land on the plates of Michelin-starred restaurants. I’m not seeing a lot of slithering items on those menus. JS: By the time you’re gnawing down on a gator tail, stabbing into a shark steak or crunching into a rattlesnake popper, you’ve triumphed over any fears. That’s one less sharp-toothed, scaly beast to turn up in your sleeping bag. Where are their creepy gods now?! I’ll tell you where: They’re in your belly. NK: Unless you wrestled that gator yourself after telling someone in a bar, “That’s not a knife,thisis a knife,” the feeling is totally undeserved. You haven’t mastered nature, you just ordered from a restaurant that found a really weird distributor. Cute animals either inspire you to be a vegetarian or prove your dedication to eating meat. JS: If you live in a desert or in a swamp, then you’re going to have an easier time getting your hands on snake, alligator, lizards and other scary future meals. (Of course, you have to know what you’re doing, since these creatures are scary for a reason.) But if you live in, say, a Cincinnati suburb, you’re probably going to have to order your scary critter online. But that’s exactly what Amazon Prime is for, isn’t it? NK: Because 90 percent of animals that we eat are cute they’re everywhere. Lambs? In every petting zoo and grocery store. Floppy-eared rabbits? Whole Foods has a good selection. Even kangaroo is available from the right butcher. Go check your fridge right now, we bet it’s full of something that was a character in Charlotte’s Web. JS: Take a bite out of a snake and never be bullied again. Just watch as onlookers swoon as you clean your teeth with a crispy fried spider leg. You’re protecting them from the evils of the world simply by digesting. NK: No one is going to think you’re a beast master because you ate a rabbit. On the other hand, they also won’t think you’re a lunatic. Try flipping through what’s left of the History Channel or the Learning Channel and look at the people shark hunting or snake wrangling. Is that the reputation you want to cultivate? 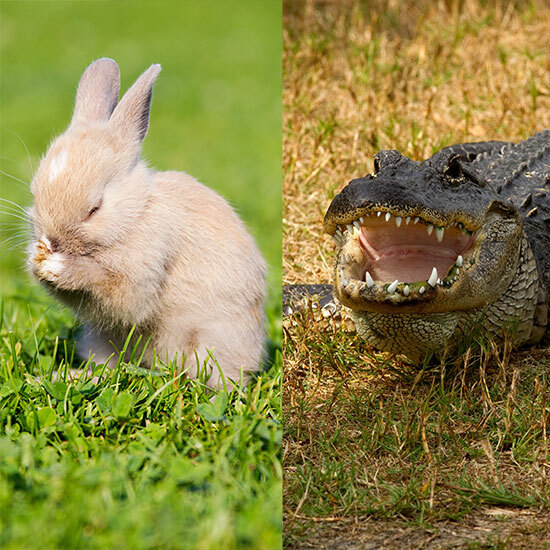 JS: In terms of animals that will haunt your nightmares and rip through your chest, alligators and crocodiles are where it’s at. They also happen to be pretty tasty if you fry up little nuggets of their tails. And their teeth make a really cool, badass necklace. What badass souvenir can you get from a lamb? A cozy sweater? NK: When it comes to “aww, isn’t that precious” animals eaten around the world, nothing can top guinea pigs. They are dressed up, skewered and fried in multiple countries in South America and by all accounts are pretty tasty. Just don’t tell that to the fifth graders who just got one as a class pet and named it Roderick Fuzzington IV.